An industrial location in danger of being closed, somewhere in southern Germany. Ex-foreman Xaver has been twiddling his thumbs for some months – he is in early retirement. His wife Karin still works at “his” former plant, a household appliances factory. Xaver feels useless. Trouble is brewing in their marriage. Now the factory is about to be shut down, and the workers are on strike, trying to prevent the worst. As an ex-union leader, Xaver becomes enthusiastic about taking part. 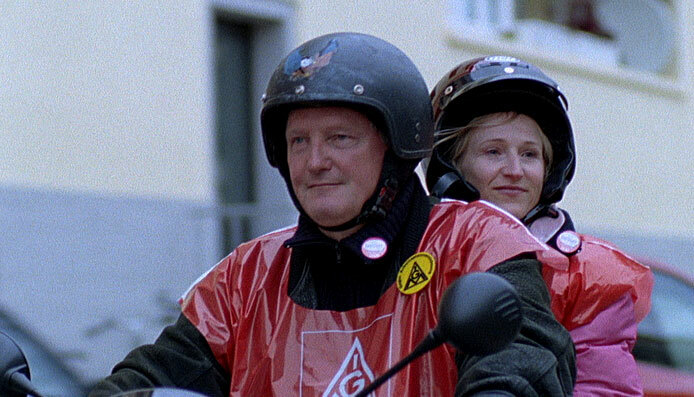 But while picketing with his former colleagues, he realizes that he is no longer one of them… “Strike Blues” blends fictional scenes with documentary footage from the strike at the AEG Nuremberg factory in the beginning of 2006, where workers were fighting for weeks against the closure of their plant. A film about the very private effects of “restructuring”.